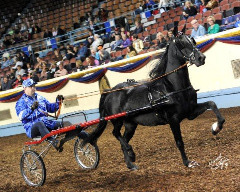 Home » American Driving Society » Family Pleasure and Class A national caliber, people-friendly Morgan Horses Available. Family Pleasure and Class A national caliber, people-friendly Morgan Horses Available. GET READY FOR SHOW SEASON, driving local trails, or raising a foal or young horse of your own. Our herd currently numbers 19. This includes young horses, horses started to driving or saddle, finished show and pleasure morgans all the way to senior citizens; stallions, mares, mares in foal and geldings. Many are for sale, and we sell our best. So far, every morgan horse that we have sold has gone on to a permanent home. A fact that we are very proud of as Morgan Horse breeders for more than thirty years. We are a three generation family farm. We have four stallions available At Stud. Two Bays, One Black, and One Chestnut. Three of the four are available For Sale. Each one is pleasant, tractable, has great conformation, good movement, and is beautiful. The two bays and the black are the ones for sale. They could also be gelded, and be spectacular geldings. No vices. Current on all vaccinations and a negative Coggins. Stand for farrier and veterinarian. All been ridden by amateurs and have been seriously prepared for driving via long-lining +. The black has been in driving training. Two gorgeous, friendly Bays, who are mature and have been ridden in various tack and who both also drive. One had significant driving training and can be driven by a 4 y/o, as well as being fine for youth and adults. The other has been an In-hand Champion and comes from superior showhorse lines. Again, no vices. Current on all vaccinations and a negative Coggins. Stand for farrier and veterinarian. Get them now; or compete against them later. Safe for home pleasure driving or Class A national caliber show horses. Perfect examples of our motto: Family Show Horses : Showy Family Horses. Ready for their own special humans. Two younger chestnut geldings. Two years old. Almost a matching pair. Family friendly; Show horse quality. Ready to be finished as an amateur trained pair or professional quality singles. Like the two older bays: Get them now; or compete against them later. Safe for home pleasure driving or Class A national caliber show horses. No vices. Current on all vaccinations and a negative Coggins. Stand for farrier and veterinarian. And NOW The MARES: We have a number of lovely ladies available; and some that we would also consider for on-farm Broodmare lease. We have a spectacular BLACK mare who is a Grand National proven showhorse in Roadster-to-Bike. She has MANY hours of professional training with a well-known driving trainer. She can alter her speed from him to an amateur owner. She is also trained for saddle, and is super friendly, and loves carrots! Safe to hook single-handed…safe to stand in harness…will not balk for amateur handler(s). Stands for the farrier and veterinarian. Has trailered locally and long distance with no balking at loading, or hauling. No vices. Current on all vaccinations and a negative Coggins. She will definitely be in the ring for someone this year…make sure that someone is you! Some other really nice mares…for pleasure/local homes or the class A show circuit or the breeding shed. Famous bloodlines up close, with the conformation, beauty, movement, presence and human-loving character than are the strong points of the Morgan Horse breed. Bloodlines that will cross well with all the popular lines. 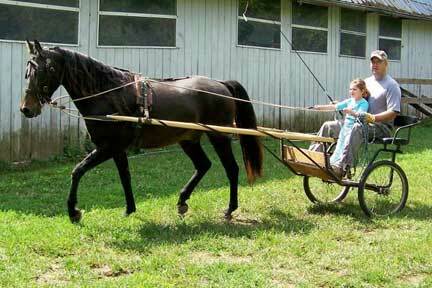 We also are acting as Agents for another long-time Morgan Horse (driving) Breeding Farm….ask us!!! Two mares in foal. Both foals will be offered For SALE. Put a deposit on one, or both, NOW!! Get your choice now; while there is still time to tune-up for show season. This entry was posted in American Driving Society, American Morgan Horse Association, Bay Gelding, Bay Gelding, Black Mare, Chestnut Gelding, Coat colors, Delano Tennessee U. S. A., Driving Horses, Driving Pairs or Multiples, Family Horses, Foals, Geldings, generation - family farm, Horse Care, Horse Sale / Horse Auction, Horse Shows, Mares, Morgan Horse, morgan horse farm, Morgan Horse versatility, multidiscipline talents and training, National caliber morgan show horses, Pedigrees, Photos, Prefix, Roadster to Bike, Sleipnir, Stallions, Training your horse to drive and tagged family horses. Bookmark the permalink.